Omelettes are a keto diet staple food. They are a perfect food for someone doing the keto diet on a budget. This omelette recipe is so tasty and filling, you are going to love it! It's a great low carb breakfast idea or for any low carb keto diet meal! Weekends call for delicious brunches. I have a nice bunch of basil in my garden that needed to be picked and some nice beautiful jalapenos ready to harvest too. Emmi sent me some of their Cave-Aged Le Gruyére try so I decided to add a bit of this rich nutty flavored cheese that pairs perfectly with the fresh green flavors. Add some garlic and farm fresh eggs to make a delicious breakfast or brunch meal. An omelet is also a tasty quick dinner too that doesn't taste like a quick dinner. I like to make one big omelet slice it and serve it on a platter so everyone can choose the size they would like to eat. There are two techniques used in making a creamy perfectly cooked omelette. First is whipping the cream and eggs together. Crush and mice the garlic, chop the jalapeno into small pieces, add salt and pepper to taste and whip into eggs. Add butter to a medium size frying pan. Heat on medium heat. Add eggs mixture to pan. The second technique is to allow the eggs to cook on the bottom they pull the edges into the center with a wooden spoon allowing the uncooked eggs to fill in the sides and cook. Repeat this until all the eggs are almost cooked. At this point add the Gruyére cheese. You can either slice it into thin slices or grate it. Then fold the omelette in half and cook just until the cheese is melted. With these two techniques you will end up with a cream delicious center and perfectly cooked eggs that aren't dry. Slice and garish with a sprig of fresh basil and slices of fresh jalapeno. Pickle Juice Pickle Juice Pickle Juice Why is Everyone Drinking it? September 01, 2018 / April A. Kind of like Beattle Juice only Pickle Juice. If you have done any kind of research into a low carb-keto diet you have probably seen posts about pickles and drinking pickle juice. The reason everyone is talking about pickles and pickle juice is because it's an excellent way to prevent you from getting headaches, muscle cramps and getting dehydrated when you are on a low carb- keto diet especially when you are first starting out. Even before I started my low carb way of eating a found out that I could stop my migraines in their tracks with some pickle juice. WHY PICKLES AND HOW DOES THE PICKLE JUICE WORK? The pickle juice just happens to be the perfect mix of salt, water, and vinegar which renew the electrolytes in your body. It also helps you stay hydrated too. Did you know that athletes drink pickle juice too? It a much better drink than those awful sticky sugar filled sports drinks. After draining several bottles of pickles of their juice I decided to make my own pickle juice. I already make pickles, I come from pioneer stock and we pickle everything! 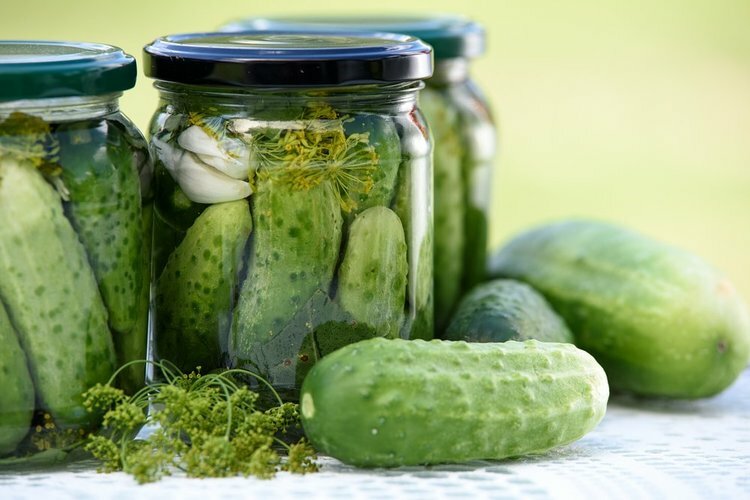 Here is our tried and true delicious pickle brine recipe. Wash and dry canning jars. In a large pot combine water, vinegars, and salt. Bring to a simmer then add garlic cloves, dill, and red pepper flakes. Simmer for 5 minutes for flavors to blend. Pour into quart jars. That's it! Peasy Peasy! Store in the fridge. July 28, 2018 / April A. Making red pickled onions are so easy to make and are one of my favorite things to top salads, wraps and a good charcuterie board. Pickled onions are popping up topping burgers and salads at all the trendy restaurants. They are something our grandmothers use to make. I don't really know why they ever fell out of popularity in food because they are soo flavory and easy to make. I loved picking out the pearl pickled onions out of my grandma's mustard pickles. I promise to post the mustard pickle recipe sometime soon because anyone who makes a roast should have some mustard pickles to add as a relish. You can make pickled onions with an onion really. I'm making a batch with both red onion and yellow onion. You will simply need vinegar and onions. That's it! See super easy! I love using my vintage ball canning jar with the glass lid and clamp on it to make pickled onions. Peel your onions. Slice your onion into thin slices. Add to a jar of vinegar. All to pickle in the refrigerator for about 2 days then they will be ready to top your hamburger, salad or add to your charcuterie board. June 30, 2018 / April A. Are you planning a springtime BBQ celebration get-together? I have the best quick but still delicious and quality grilled dinner idea for you, your friends and your family. It's a Hot Dog Toppings dinner party. It is seriously the easiest to plan and make. It's also a HUGE crowd pleaser. The kids, as well as the adults, will love it. I put together a list of premium toppings I thought would cover everyone's tastes to go with Hebrew National® All-Beef Franks. One of the things I love about Hebrew National® All-Beef Franks is that the hot dogs are good premium cuts of 100% kosher beef. Quality is always something I look for when planning dinner. For our Hot Dog Bar, I added fresh ingredients. I made sure to chop the pieces smaller than I usually do so they could fit nicely on the bun. I bought freshly made buns from a local bakery and chose some tasty toppings, including onions, avocado, tomato, peppers, sauerkraut, a spicy green sprout mix, a variety of mustards and, of course, some ketchup. You can pretty much add any that you love. Think of your favorite salad-bar toppings if you are looking for some inspiration. With the kids, you can tell them to choose three toppings so they are sure to get some veggies in their meal. My family loves it and it's definitely on our list of things to make when friends come over. Happy spring! for more recipes & dinner ideas!